Car hire from Paphos airport is a popular choice with many passengers landing at Paphos International Airport as it can be a very cost effective means of transfer, especially if you are travelling in a small group. Although public transport has improved in Cyprus over the past few years, the public transport network across the island is still not the best and although there is a regular and very efficient bus service that connects passengers from the airport to the centre of Paphos itself, if you are wanting to travel further afield, it may prove to be a little more tricky relying on public transport. 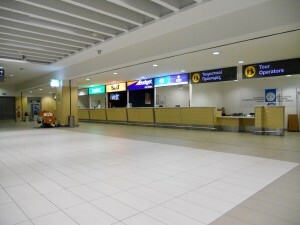 There are several car hire companies that have desks inside the airport terminal and these are located in the main Arrivals Lobby. As you enter the main Arrivals Lobby from the Baggage Reclaims area, the car rental desks are situated to the left. If you have pre booked your Paphos car hire in advance (which is always advisable), you should make your way to the appropriate car rental company desk. You should ensure that you have the correct paperwork and documentation required to enable you to collect your car upon arrival at the airport. Driving Licence – Paperwork and receipt for booking – Voucher slip (if applicable) and a bankers card for your deposit. Please Note: Some car rental companies operate a ‘Full to Empty’ policy on their car hire and this means that they provide a full tank of fuel with the car and you do not have to return the car with a full tank of fuel. They will charge you for a full tank of fuel when you collect the car and you can drop the car of empty on your return. However, you will not receive any refund for any amount of fuel that is left in the vehicle when you return the car, even if you do not use all the fuel. Check your policy before you book! It doesn’t work out too bad if you intend using the car a lot during your stay and cover a large amount of miles where you will use the fuel but if you don’t, you will have paid for a full tank of fuel and not used it! Local Tax: Most companies will charge you a local tax when you collect the car. Once you have presented the appropriate documentation to a member of staff at the car rentals desk, you will be issued with your keys to the car and you will then be directed to where your car is parked. Usually, all the car hire vehicles are parked in numbered bays opposite the airport terminal on the far end of the car park. Simply exit the airport terminal and walk straight forward crossing the road. Walk down the middle of the Palm trees towards the car park and you will see the car hire vehicles in the bays on your left. Hiring a car from Paphos Airport has many advantages and provides you with total freedom from the moment you arrive at the airport. If you are landing at Paphos Airport and are wanting to travel to any of the other resorts in Cyprus such as Ayia Napa, Limassol, Larnaca or Protaras, then car hire could be your best option. Catching a taxi or shuttle bus to any of the above resorts can be a costly exercise and to be honest, car hire can work out cheaper, especially if there are several people traveling in your party. For example, a taxi from Paphos airport will cost between 125 euros and 150 euros (one way) depending on the time of day and a shuttle bus from Paphos Airport to Larnaca will cost 18 euros per person (one way). When you consider that you can hire a car from Paphos Airport for a week for less than £130, it really is a no brainer! Many people when traveling abroad don’t want to hire a car because they don’t feel confident about driving on the opposite side of the road. If you are normally nervous about driving whilst abroad, don’t worry because in Cyprus, they drive on the same side of the road as in the UK (the left). The added bonus about hiring a car in Paphos for your transfer, is that you then have transport for the duration of your holiday. The car is then there if you want to visit the many attractions that Cyprus has to offer such as Troodos mountains, Aphrodites Baths, Aphrodites Rock, Nicosia, Famagusta and many more. Another added bonus of car hire from Paphos Airport is that you do not have to wait around for other passengers at the airport. This is especially beneficial if you have a late night flight or you are traveling with children. It also means that on your return to Paphos International Airport, you do not have to wait around at the hotel or apartments to be collected and then have to set off hours before you need to be at the airport. Many people fly into Paphos Airport and need to get across to Larnaca Airport either for a connecting flight or simply because they choose to fly back home from Larnaca Airport. The distance from Paphos Airport To Larnaca Airport is approximately 126klms (78 miles) and takes about 1hr 30mins to drive. It is possible to collect a car from Paphos Airport and then drop it off at Larnaca Airport. This is a popular choice with passengers who need to get to Larnaca Airport form Paphos the shortest time possible without relying on public transport. There are thousands of websites on the Internet offerring car hire Paphos airport and it can sometimes be a complete nightmare surfing them all and trying to find the best deals. I have hired a great number of cars from both Paphos and Larnaca airport and I use a couple of car hire companies that I find consistantly offer good deals on car hire from Paphos Airport. Using one of the car hire comparison websites is often the quickest way to ensure you find the best deals for the period you wish to purchase car hire in Paphos. To the top right of this page you will see a search box that you can use to search all the major car hire companies in seconds and find the cheapest car hire deals for Paphos. I have also provided a few other links below to the companies that generally offer good deals on car hire from Paphos Airport. Obviously, you can shop around but I normally find that the companies listed offer the best deals. Please remember that all car hire companies terms and conditions vary. Each company has their own policies and it is advisable to check them before making a booking. Also, it is advisable to pre-book any extras that you may need such as child seats, roof racks etc… This will then ensure that your request will be fulfilled and will avoid dissappointment at the airport. Don’t forget to pack all the required documents before you travel such as booking voucher and driving licence. You will be reuired to present these documents to the car hire company in the Paphos airport arrivals area once you land. I hope that this page and the information on it, helps you in choosing and finding the best deals on car hire Paphos airport to suit your requirements and budget.